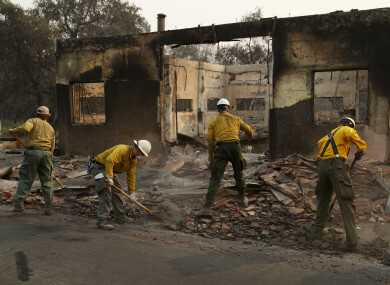 Fire crews clear rubble from the road near a building in Paradise, California. IN CALIFORNIA TODAY, the dead were found in burned-out cars, in the smoldering ruins of their homes, or next to their vehicles, apparently overcome by smoke and flames before they could jump in behind the wheel and escape. In some cases, there were only charred fragments of bone, so small that coroner’s investigators used a wire basket to sift and sort them. At least 29 people were confirmed dead in the wildfire that turned the northern California town of Paradise and outlying areas into “hell on earth”, equaling the deadliest blaze in state history, and the search for bodies continued today. Nearly 230 people were unaccounted for by the sheriff’s reckoning, four days after the fire swept over the town of 27,000 and practically wiped it off the map with flames so fierce that they melted metal off cars. The dead were so badly burned that authorities brought in a mobile DNA lab and consulted forensic anthropologists for help in identifying them. Friends and relatives of the missing called hospitals, police, shelters and the coroner’s office in hopes of learning what became of their loved ones. Paradise was a popular retirement community, and about a quarter of the population was over 65. Tad Teays awaited word on his 90-year-old dementia-stricken mother, who lived about a mile from him in Paradise. And Barbara Hall tried in vain to find out whether her aunt and the woman’s husband, who are in their 80s and 90s, made it out of their home in a retirement community in town. The blaze was part of an outbreak of wildfires on both ends of the state. Together, they were blamed for 31 deaths, including two in celebrity-studded Malibu in Southern California, where firefighters appeared to be gaining ground against a roughly 370-square-kilometre blaze that destroyed at least 370 structures, with hundreds more feared lost. Some of the thousands of people forced from their homes by the blaze were allowed to return, and authorities reopened US 101, a major motorway through the fire zone in Los Angeles and Ventura counties. All told, more 8,000 firefighters statewide were battling wildfires that scorched more than 840 square kilometres, the flames feeding on dry brush and driven by blowtorch winds. The cause of the two biggest fires on opposite ends of the state was under investigation. Pacific Gas & Electric Co told state regulators that it had a problem with an electrical transmission line near the site of the Northern California blaze minutes before it broke out. In Northern California, fire crews still fighting the blaze that obliterated Paradise contended with wind gusts up to 64 kph overnight, the flames jumping 300 feet across Lake Oroville. The fire had grown to 303 square kilometres and was 25% contained, authorities said. Email “Town of Paradise turns to 'hell on earth' after deadly wildfires devastate California”. Feedback on “Town of Paradise turns to 'hell on earth' after deadly wildfires devastate California”.